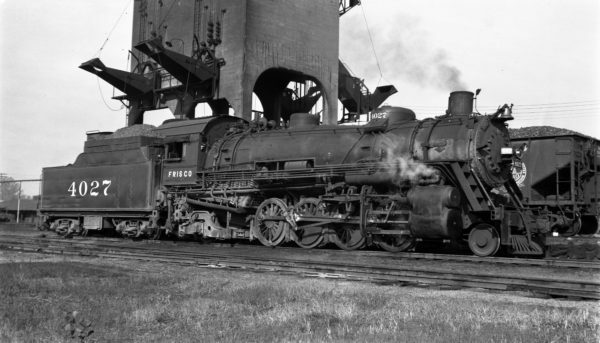 2-8-2 4027 at Fort Smith, Arkansas on August 23, 1948 (Charlie Winters). 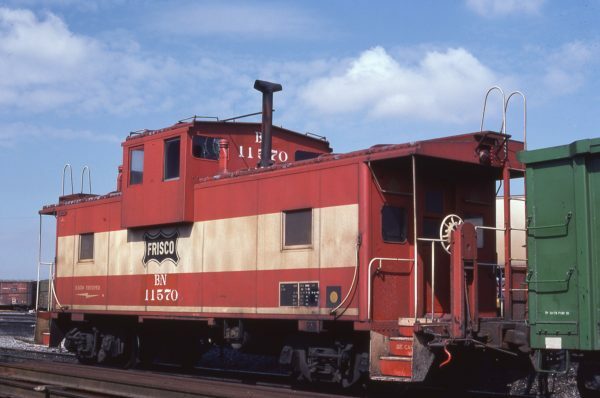 Caboose 11570 (Frisco 1242) at Cicero, Illinois on March 22, 1982 (G. Allbach). E8A 2018 (Ponder) at Kansas City, Missouri in September 1964. The photograph of Frisco E8A, SLSF 2018 (Ponder), is at Kansas City Union Station. 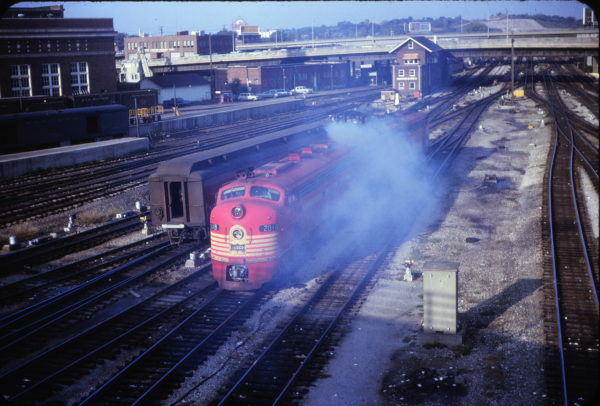 The photo was taken from the Central Avenue viaduct (now gone) over the west end station tracks. The view is looking west, with Kansas City Terminal (KCT) Railway’s Tower 5 above the engines in the background. Beyond the tower in the Pennsylvania Avenue viaduct over the west end platform tracks throat of the depot. Later after the original tower and bridge were removed a new bridge was constructed. The new (today’s) Broadway Avenue bridge was constructed. It is an “s” shaped bridge on a totally new alignment linking Broadway Avenue (to the north), with Pennsylvania Avenue (to the south). In the upper left corner of the photo is the power house for the union station complex. Previously, the Tower 5 and station’s power house prevented Broadway from extending south. To the right is the single story Centralized Traffic Control (CTC) building, also belonging to the KCT. Just below the power house are the loading docks for the express and postal tracks on the west end of the station. Also, today the station’s power house has been renovated and re-purposed. It is now the home of the Kansas City Ballet. The station has also been renovated and restored to much of its former glory. The station complex are well worth a visit on any travel to Kansas City!